Tulane’s Center for Environmental law is a critical component to help save Louisiana’s fragile coastline while expanding the state’s expertise in the balance of natural resources, Gov. 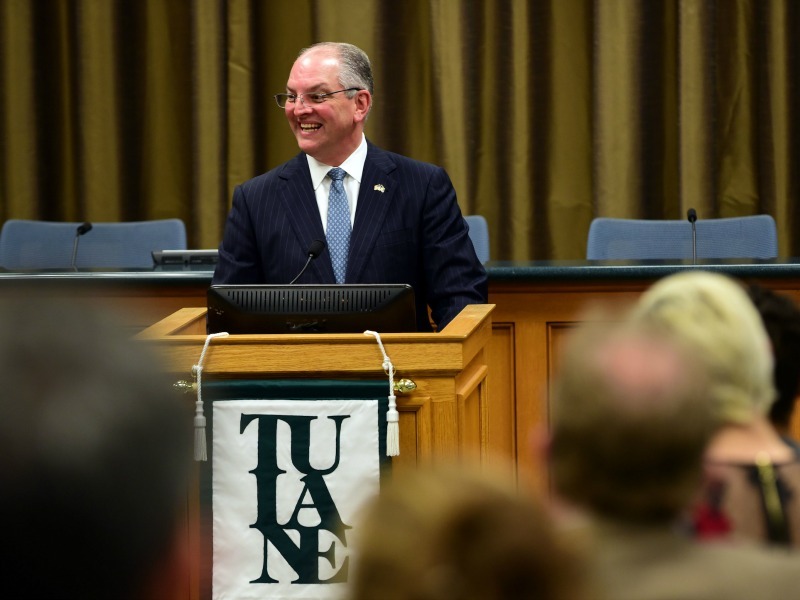 John Bel Edwards told those gathered at Tulane Law School to mark the Center’s launch March 21. Calling that expertise a “highly exportable commodity” as the world faces climate change and other environmental issues, Edwards celebrated Tulane’s commitment to remain responsive to these emerging challenges. “Louisiana is at the forefront of tackling these issues, and we will be ready to share these experiences and lead the way,” Edwards told dignitaries, students, alumni and faculty gathered at the event to formally announce the center’s mission. Edwards called Louisiana’s top environmental problems a trifecta: Erosion, subsidence and sea level rise. These pose challenges that many around the world have never faced before. The new center will be an umbrella for existing environmental programs and events, as well as a launch pad for innovation and new programming at Tulane. It also will be the link between the law school and those working on environmental policy across the campus, and provide a platform for collaboration and research. Tulane President Mike Fitts spoke of Edwards’ commitment to environmental policy that makes sense for Louisiana, reminding those gathered that Louisiana is losing a slice of land the size of a football field every hour. “The Governor is someone who is committed to the state’s coastal master plan that will truly help save our state from washing away,” Fitts said. Following comments by dignitaries, a panel of alumni, scholars and advocates discussed the state of environmental policy and the urgent mission of the Center to help protect Louisiana’s wetlands. Patricia Murray (L’84), Former Judge, Fourth Circuit Court of Appeal (1994-2010); Adjunct Professor of Toxic Torts, Tulane Law. Since 1979, Tulane has been a leader in the study of environmental issues and advocacy. Forty-six years later, it boasts one of the nation’s most comprehensive curricula in the field, the largest faculty-supervised environmental law clinic in the country and an influential think-tank on water law and policy. Professor Mark Davis, the longtime Director of the Tulane Institute for Water Resources Law and Policy and more recently of Tulane University’s ByWater Institute, will serve as the founding director of the new Center. The Center will also be a platform to raise substantial funding to support a significant expansion of Tulane’s strength in the field, Meyer said. Begun with a generous gift from McKeige, it will become one of the most significant fundraising priorities for the Law School in Tulane’s $1.3-billion Only the Audacious Capital Campaign which launched in December 2017. Another critical contribution to the Environmental Law Center’s resource development is focused on the Law School’s capacity to attract top faculty talent in the area of environmental law. An initiative to fund a faculty Chair in Environmental Law was recently launched with generous founding gifts by the law firm Jones, Swanson, Huddell and Garrison, LLC, which includes in its ranks Tulane Law alumni Glad Jones (L ’92), Kevin E. Huddell (L’00), Bessie Antin Daschbach (L’01), Tad Bartlett (L’00) and Lindsay Reeves (L’09); and alumni couple Steve Murray Sr. (L’67) and the Honorable Patricia Murray (L ’84), who was part of Thursday’s panel. The faculty chair will be named in honor of Houck, who helped found Tulane’s environmental law program and remains one of the country’s most influential figures in the field. For students, the related initiatives to expand support for environmental law will mean an enhanced curriculum, greater opportunities for research and public service as well as access to internationally-renowned faculty, internships and alumni. In short, it will make it easier to “know what we do, and how to engage alumni and our community to create greater opportunities for students,” Davis said. The Center now occupies new quarters in the Law School Annex next to the John Giffen Weinmann Hall, where it will be housed alongside the new Tulane Center for Energy Law.